Gave it a second shot. Loved the style, but found it too scripted. With high graphics (not possible at the time) and played parallel with the real sims, it's a good complement. @Hejix Even with the scripted gameplay, I loved Medieval so much. It was just the atmosphere of the game, as well as the weird, quirky tasks you sometimes needed to do to make the day go on. 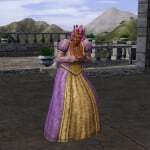 It makes me really wish we could get a fully realized companion to TS4 that was set in the medieval era. Or at least a time travel expansion to let our Sims go there and possibly live there. I loved the medieval. But it is not even working on my windows 10 would definitely buy if there were something like that again. @GamingTweety It works on origin with windows 10! I contacted ea to get a code. I gave my disc game serial number and I had to give a receipt for the one I bought on Amazon. Works like a charm!